Brundlefly & the Swede: "Cabin Music"
Cabin Music is the long awaited record from Brundlefly & the Swede, which is a duo consisting of Matthew Kohnle (DAYBED, and the Swede, Hat City Intuitive) and Jason Socci (DAYBED). An instrumental record, pitching it’s sound between the idyllic acoustic leanings of Jim O’Rourke, and the adventurous tonality of vintage Yes... The record owes a debt to mid nineties 90’s era “post- rock” as well- in it’s fearless sense of movement and experimental leanings. The album plays as two complete sides of uninterrupted and constantly evolving music, finding focus in the intricate acoustic guitar center, fanning out broadly into full electric accompaniment, and accented beautifully with strings, flutes and bass clarinets. VINYL COPIES NOW RECEIVE TWO BONUS TRACKS, "SIDE C" and "SIDE D (all of the above)" AS FREE DOWNLOADS! Oddly comforting record of early 70's odd pop in the vein of Jim O'Rourke's easier listening, Nick Drake's somber mood, all the while politely hinting that "Something, Anything" era Todd Rundgren was right at least part of the time. 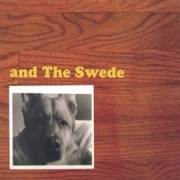 "And The Swede is the chosen moniker of solo artist Matthew William Kohnle, who wrote, recorded and performed the songs on the disc by himself. His style is sedate and subdued, found somewhere between the quiet depression of Joe Pernice and the understated other-worldliness of Pink Floyd.